Every November on the Wednesday of Geography Awareness Week the world celebrates GIS Day. 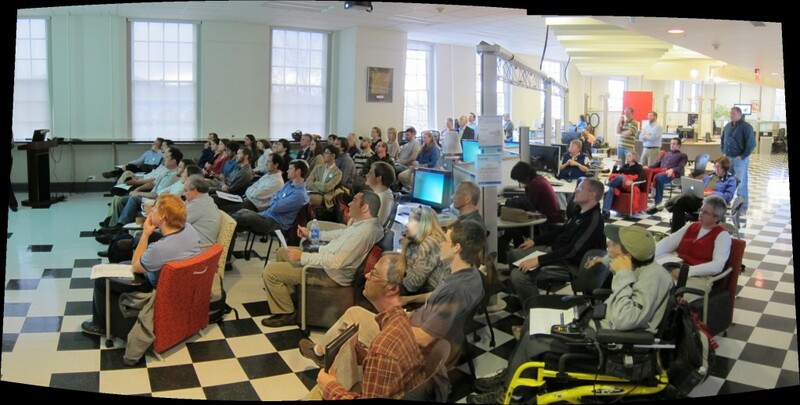 On that day in Charlottesville the geospatial community gathers in the Scholars’ Lab for mappy goodness. 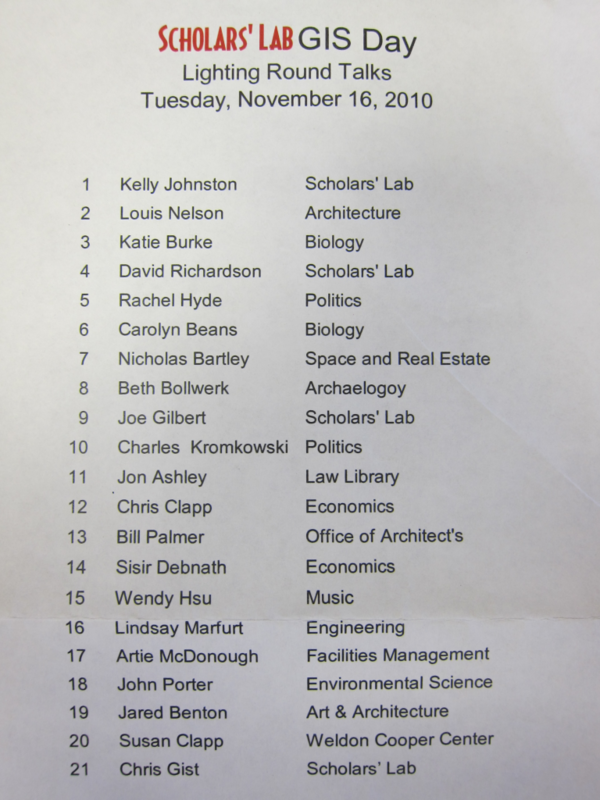 In 2010 we threw open the Scholars’ Lab doors for folks to present geospatial lightning talks. We were impressed by the breadth of GIS work ongoing across our community. And lots of people came to hear these mappy stories. Face it, you love maps. 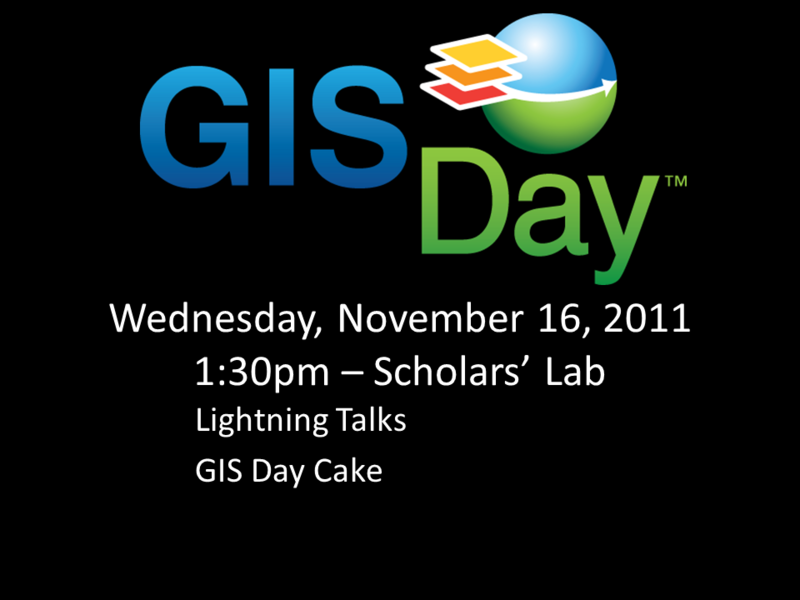 We invite you to join our band of Virginia Mapheads as we celebrate World GIS day 2011 with a lightning-fast show of the world’s coolest geowork in the Scholars’ Lab on Wednesday, November 16 at 1:30pm. Sadly, I know many of you don’t have the pleasure of working all day every day with maps and geodata, so treat yourself to a once-a-year map fix. You know you deserve it! And bring a friend. Again, we have a compelling lightning talk lineup for 2011. Your reward? 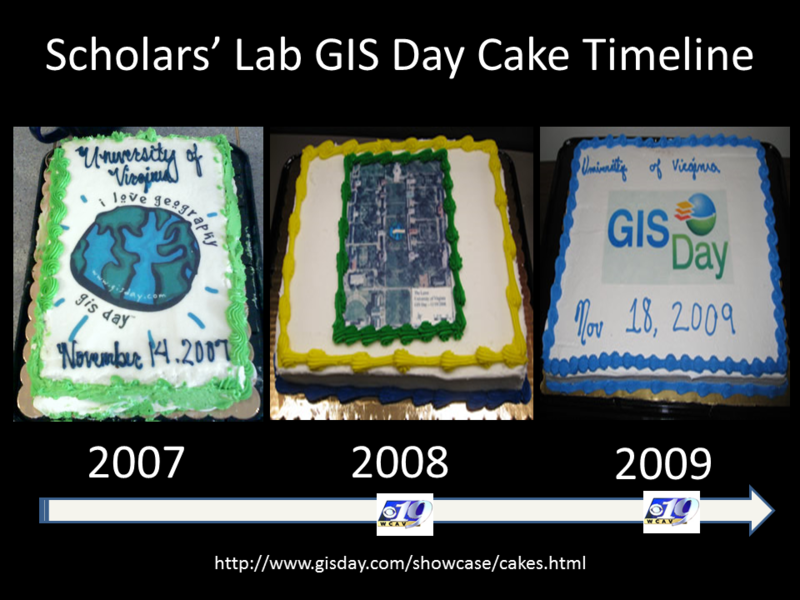 Two slices of our soon to be legendary 2011 GIS Day geocake to be revealed on GIS day! 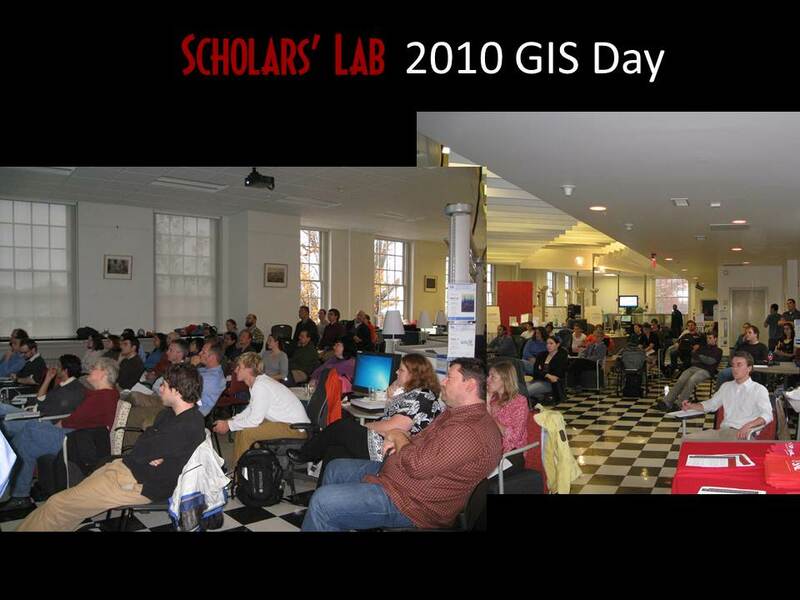 Over 70 folks enjoyed our 2011 GIS Day celebration in the Scholars’ Lab. 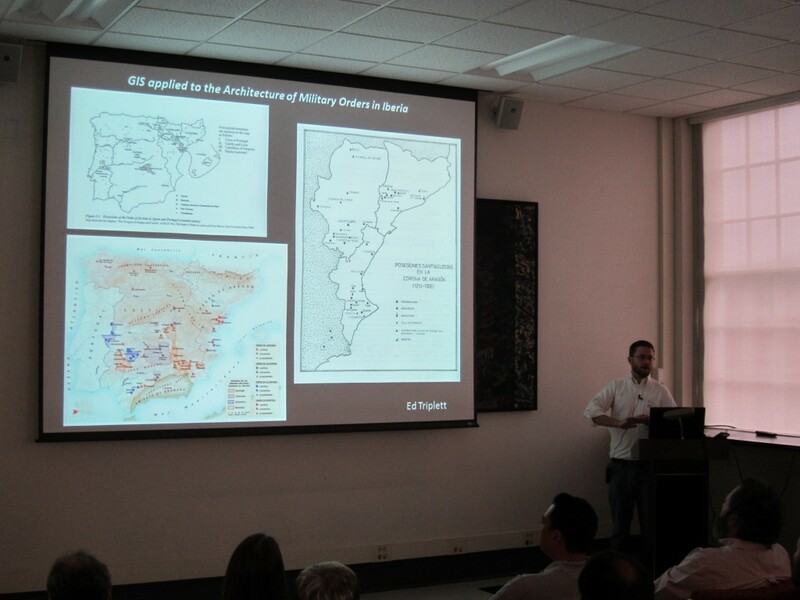 Speakers ranged from wily GIS veterans to those who’d recently started using geospatial tools. 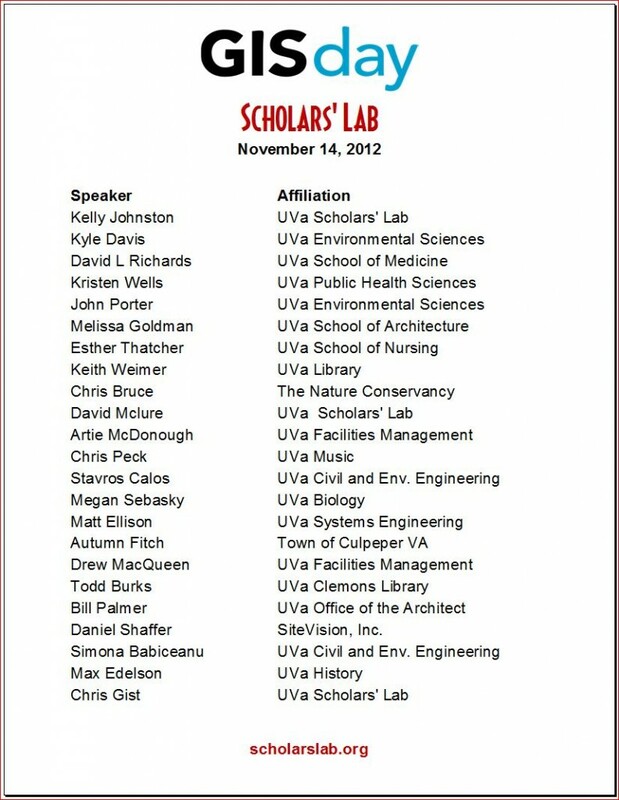 Check the speaker list above to see the wide range of topics. 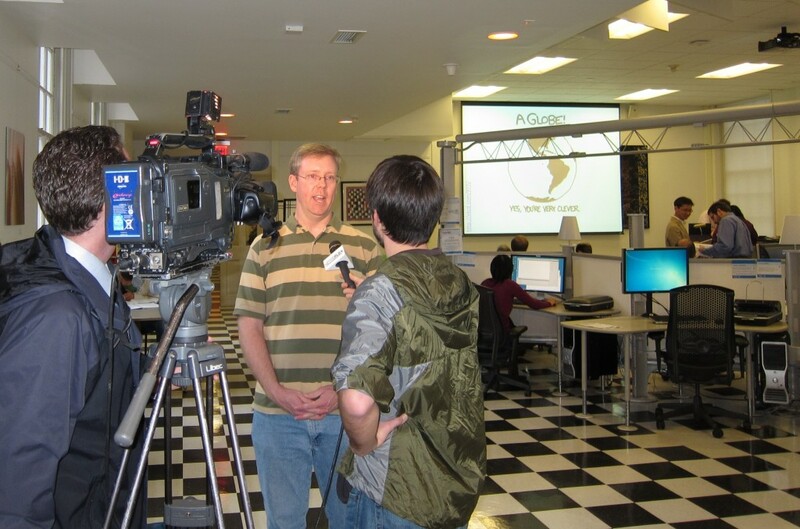 The Charlottesville CBS station sent their GIS Day team to cover the event interviewing Eric Johnson, Scholars’ Lab Head of Outreach and Consulting. 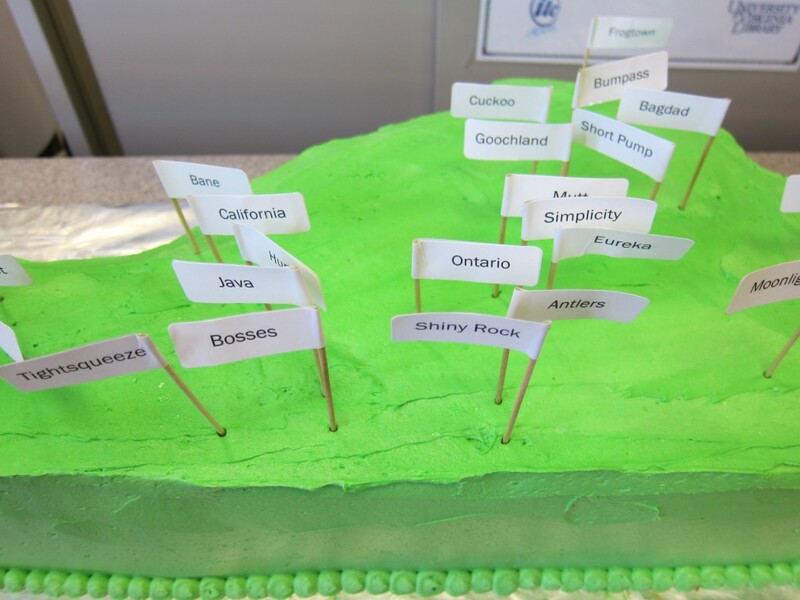 And we feasted on the already legendary Virginia-shaped geocake decorated with flags marking unusual place names. All this was followed by delicious hot mulled cider. 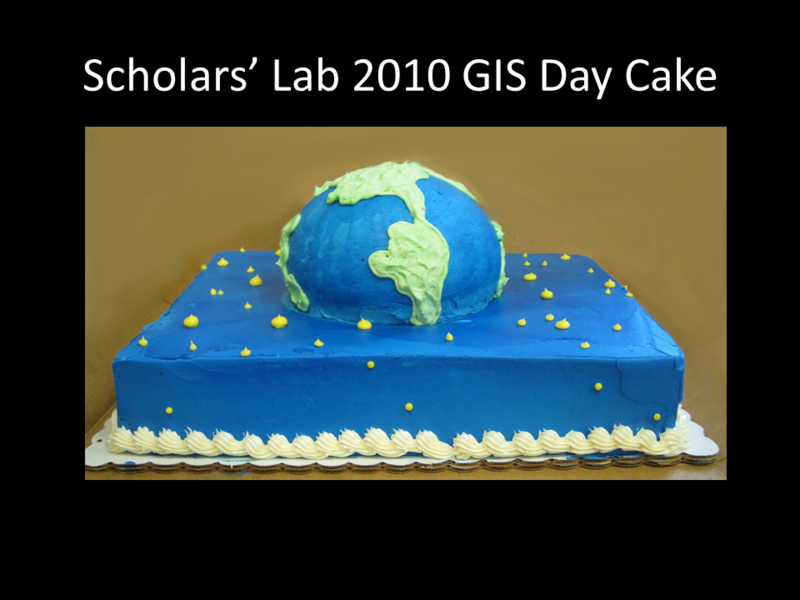 Thanks to everyone who played a part in making GIS Day 2011 a mappy success! 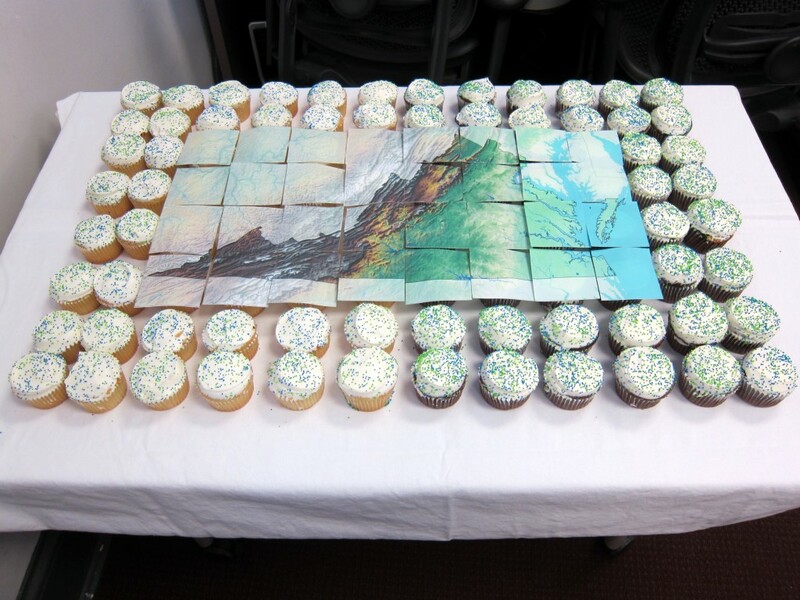 The Scholars’ Lab celebrated GIS Day 2012 with lightning talks on spatial topics, one-of-a-kind GIS Day buttons, cartographic cupcakes, and hot mulled cider. 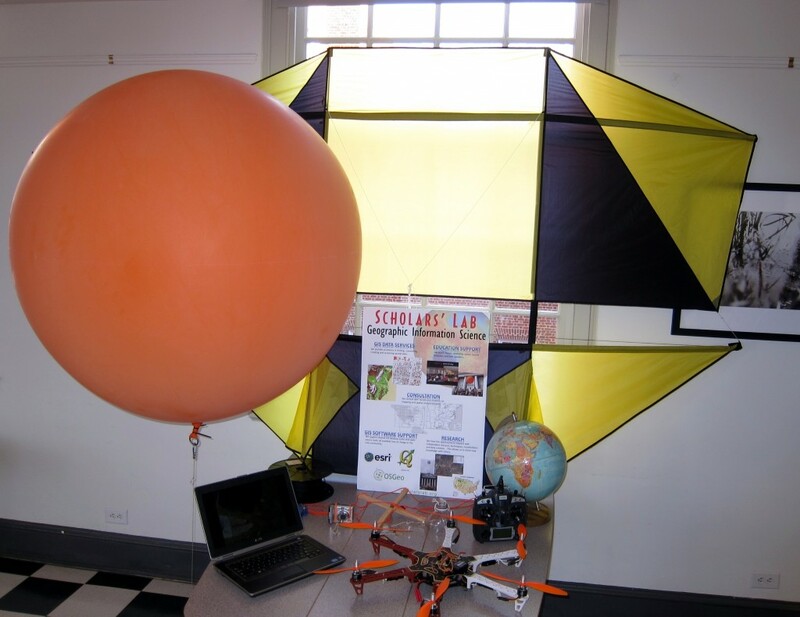 We highlighted our recent work with Do It Yourself Aerial Photography using balloons, kites, and copters. Some folks didn’t want GIS Day to end. 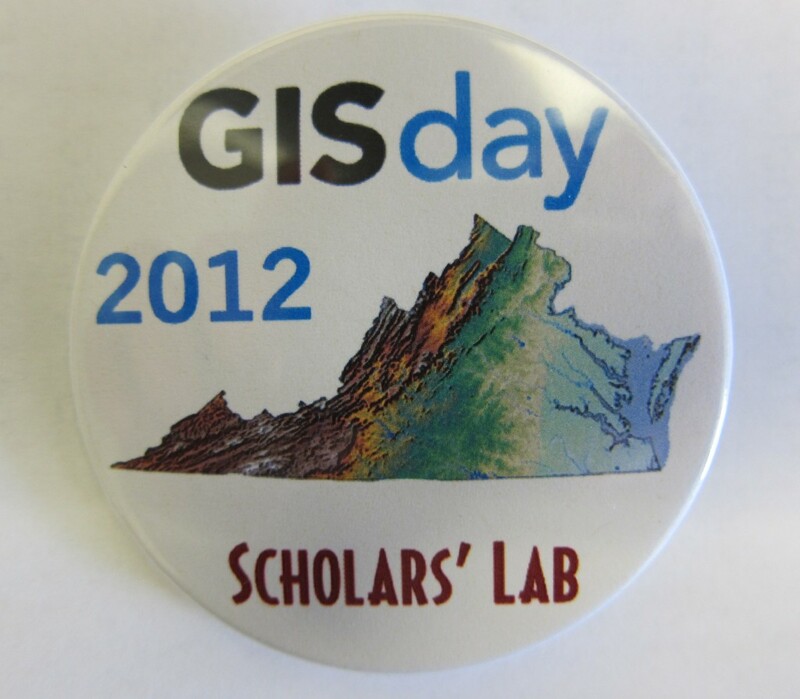 Thanks to all the friends of the Scholars’ Lab who made GIS Day 2012 a mappy success! 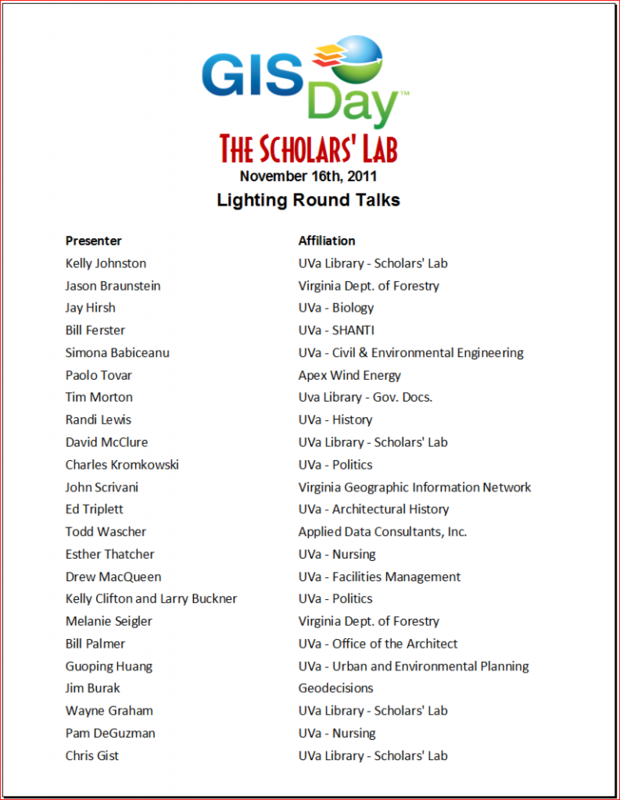 And thanks to Ronda Grizzle of the Scholars’ Lab for producing this 2012 GIS Day lightning talk video. Cite this post: Kelly Johnston. 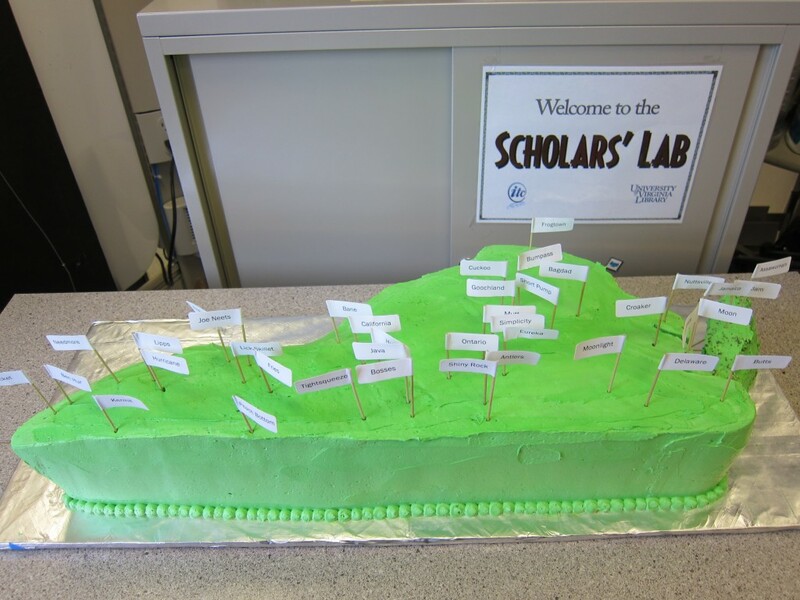 “The Mappy Goodness that is GIS Day in the Scholars' Lab”. Published November 15, 2011. https://scholarslab.lib.virginia.edu/blog/the-mappy-goodness-that-is-gis-day-in-the-scholars-lab/. Accessed on .